Chief Keith Humphrey speaks to the audience after his taking his oath of office. "He will strengthen for some and others what has been a city in need of making certain that we not only protect and serve its community, but the community understands that we are protecting and serving," Scott said. Scott also said safety is a priority for the city. 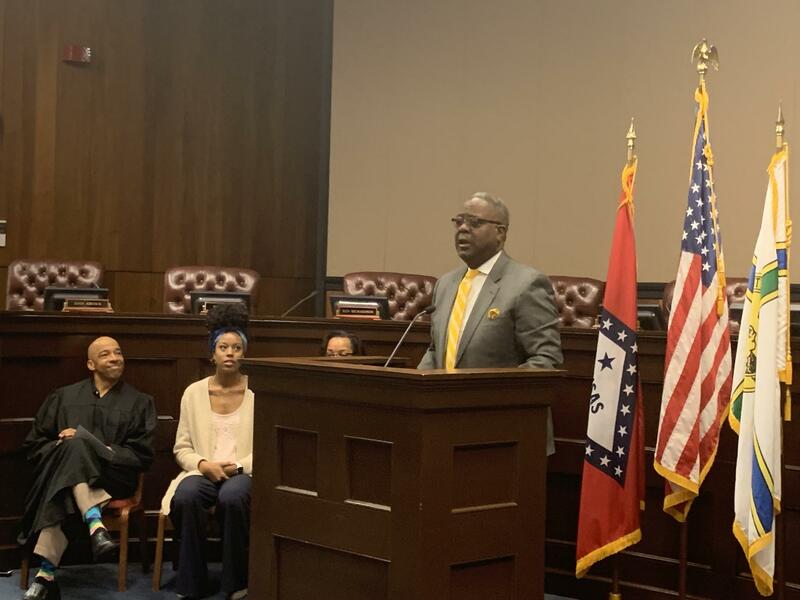 "As we work together, we will create the city of not only a great city of Little Rock, but for the city of Little Rock to be the safest city in the state of Arkansas, and the south in this great nation,' Scott said. Judge Mark Leverett of the Little Rock District Court administered the oath to Humphrey. After the oath, Humphrey, formerly the police chief in Norman, Oklahoma said he initially offered to start in late April, but wanted to move the date up sooner. "We got a lot of work to do. This is a great department, it really is. All of the research that I’ve done. I’m fortunate enough to know a lot of people here. We’ve visited this city on numerous occasions and let me tell you, whatever’s fractured, we’re going to fix. I can promise you that," Humphrey said. Calling the job a "dream come true" and that he was excited to get started, Humphrey also said he is not one to mince words. "I’ll never lie to you. I’ll always be honest. You may not like some of the things I say, but I will do it in tact, I can tell you that. I will do it very professionally. I will listen," Humphrey said. While Humphrey is now the chief, Little Rock will also conduct a change of command ceremony on Saturday, April 28 at the Robinson Center.